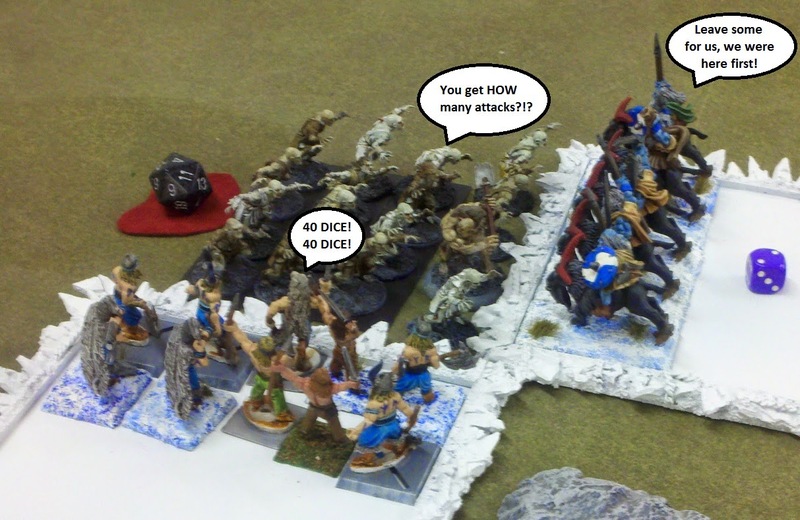 My friend Skrapwelder & I played our 1st game of Kings of War from Mantic Game. 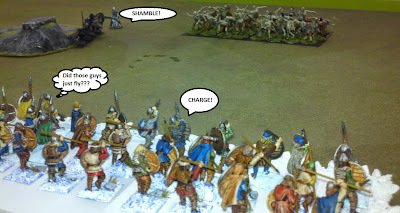 It's a simplified, somewhat abstracted army scale fantasy game. 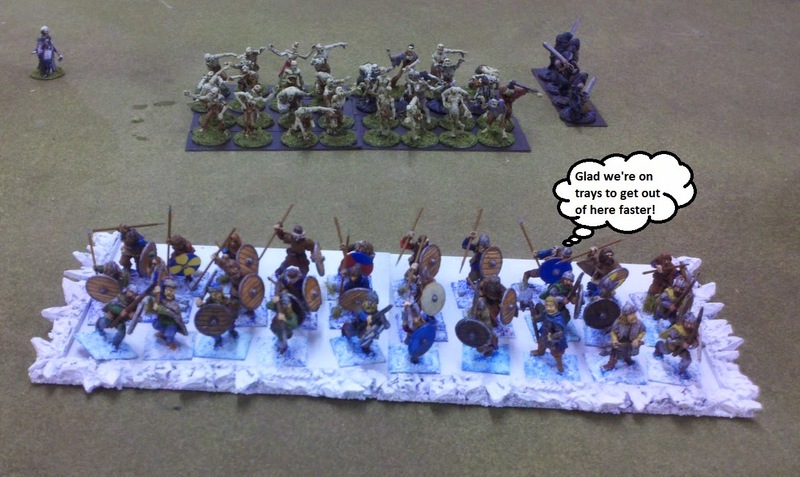 I found myself having to unlearn some basic wargaming assumptions to understand the rules. But the simplification and abstraction means it's pretty fast and very little to argue about. This is our position after set up. 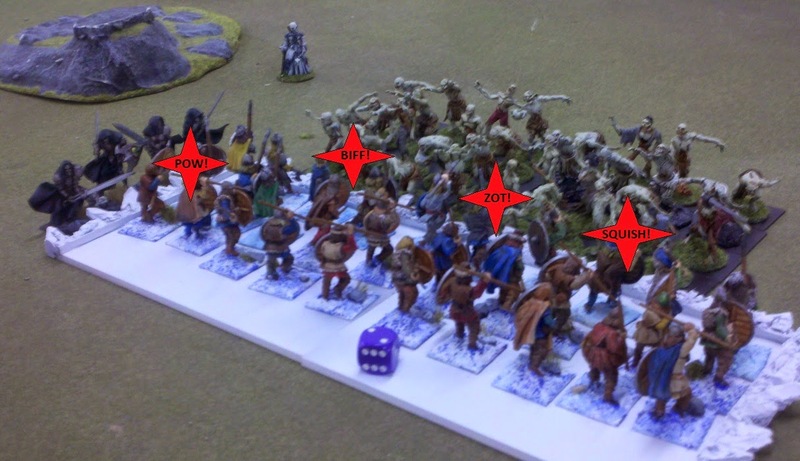 My archers have the ability to make a move before the game begins, so they were trying to flank the zombie horde. The arrows show the initial moves. I was shocked to find the Wraiths move 10" normally, which means they charge 20". 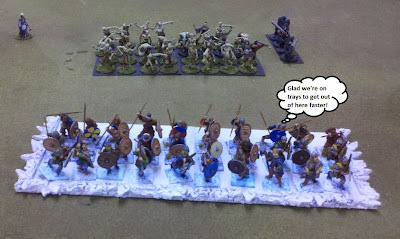 They surprised me by crossing in front of the zombies, catching my archers in the flank & routing them on the 1st turn. So much for whittling the zombies down with bow fire. The view from my Ax Horde after the archers have just been seen off by the dark shadows over on Weathertop. On the right flank, my Gore Riders charge the Ghouls, while my Moraxs mess around in the rocks off to the left. 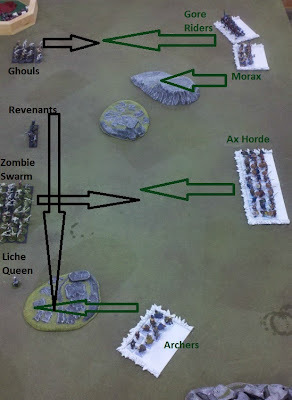 Finally the Moraxs are able to flank the Ghouls and obliterate them in 1 round. As the Ax and zombie hordes fight back and forth, damage piles up on my forces. 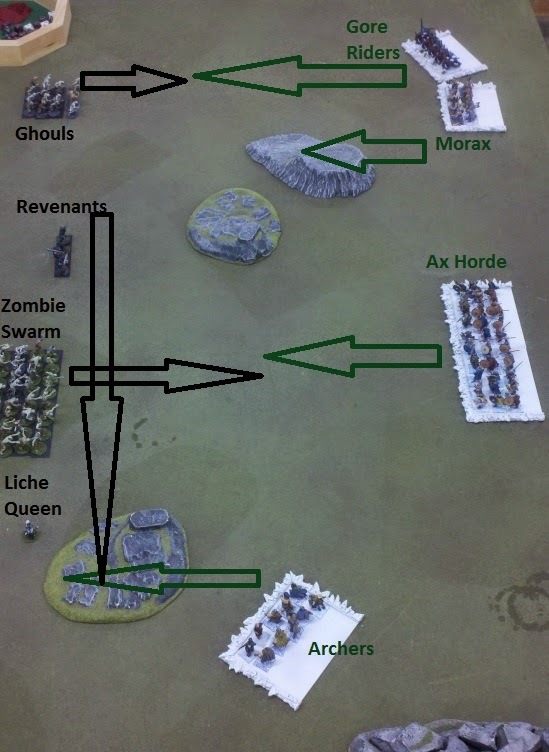 But the Liche Queen is able to keep the zombies healed, so it's a loosing battle, especially when the Wraiths attack in the flank. After blowing through the Ghouls, my Moraxs & Gore Riders aren't able to reposition fast to reach my Ax Horde before they rout. As revenge, my Gore Riders the disolve the Wraiths in a single attack. Skrapwelder went 1st by predictibly charging his zombies in my MorAx, & then did the 2nd surprising thing of the night. His Liche Queen Zapped my Gore Riders with a huge bolt, & he rolled high enough on the Nerve test that the Riders melted away. 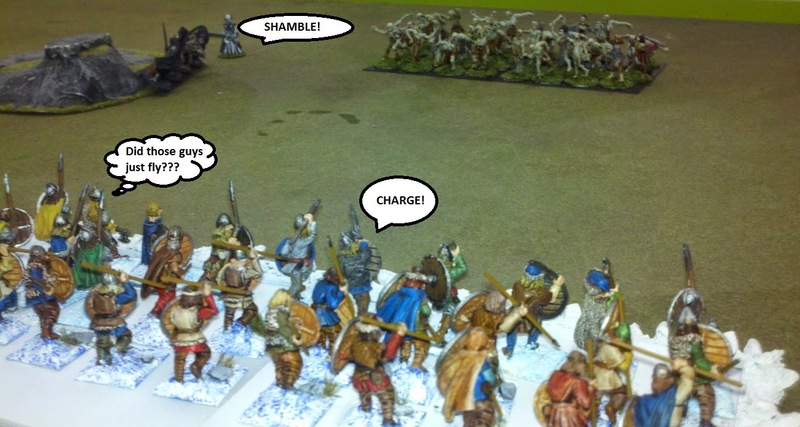 & the zombies chomped through the Morax, destroying my last unit. I went from thinking the game would end in at least a draw if not a victory for me, to a solid loss. But that 1 Zap spell could have easily gone the other way & I could have destroyed his zombies instead. Overall, a very good 1st game. We both made sure to read the rules a few times before the game, & we only came across 2 additional questions that we couldn't answer ourselves. So pretty good for a 1st try. Also, the game probably took less than 90 minutes including lots of discussing & looking up rules. So it gets the "Definitately want to try it again" recommenation. Next week, we'll probably try 1000 pt armies.